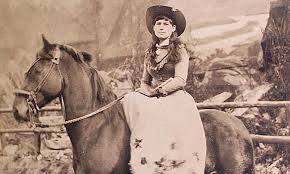 Phoebe Ann Mosey, (or Moses) most commonly known as Annie Oakley, learned self-reliance at a young age. Her family lived in a cabin near Greenville, Ohio, where the winters were often treacherous. When she was six years old, Annie’s father left the home in a snowstorm. He returned frost-bitten and grievously ill. He died a few months later of pneumonia, leaving the family in a dire financial situation. Her mother married again but the finances did not improve. Unable to feed all of her children, Susan Mosey sent Annie and her older sister, Sarah Ellen, to the “poorhouse” also known as The Darke County Infirmary. Put in the care of the superintendent and his wife, and Annie and Sarah learned housekeeping skills in addition to embroidery and sewing. Exceptionally cruel to their young charge, the couple would often beat Annie or lock her in a closet. Once, when she fell asleep doing some darning, they punished her by throwing her out into the snow with no shoes for the night. After two years of abuse from “the wolves,” Annie escaped and found her way back to her mother, who was again widowed and remarried. The family still lived in poverty. The only item that remained in the house belonging to Annie’s father was his shotgun. Longing for her father, Annie taught herself to shoot and started hunting game to help feed her family. Word got out about Annie’s deadly aim and she soon started selling the game she killed to the locals in Greenville, as well as to the restaurants and hotels in Southern Ohio. Her birds were well sought after because Annie always hit the birds in the back of the head, leaving no shot pellets in the tender meat. By fifteen years of age, Annie made enough money to pay off the mortgage on the family farm. On Thanksgiving Day in 1875, the Baughman and Butler shooting act came to Cincinnati. Shooting was a popular past time and shooting contests were the perfect way for people to showcase their talents. Frank Butler, the traveling show’s marksman placed a bet for $100 (equivalent now to about $2,000) that he could beat any local shooter. Annie’s friends and family urged her to travel to the big city and try her luck. In the end, luck had nothing to do with it, but pure skill did. Imagine Butler’s surprise when fifteen-year-old, five-foot petite Annie turned up as one of the challengers. One by one, the targets were released (either live birds or glass balls). Annie shot and then Frank shot, neither one missing until the 25th target. Frank missed. The young, child-faced girl from Greenville won. While most men might have had their pride wounded, or might have been angry at a teenage girl besting them at this coveted skill, Frank Butler’s reaction was quite different. Smitten by Annie, after the contest he gave her tickets to his show. Soon, the two fell in love and married. Annie joined the Baughman and Butler shooting act, not as a shooter, but as Frank’s assistant. One week, Baughman could not perform due to illness. Annie stepped in. Per her usual performance, she never missed a target and the crowd fell in love with the pretty petite sharpshooter. She permanently replaced Baughman and the couple took their show on the road. In 1885, Annie auditioned for Buffalo Bill’s Wild West show. Impressed with her accuracy and lady-like demeanor, Bill Cody hired her, and Frank became her manager. Annie soon became the star attraction of the show and remained so for seventeen years. Whether she used a pistol, rifle, or shotgun, “Little Sure Shot,” as she was named by Chief Sitting Bull (also a star of the show,) rarely missed. Her feats included shooting a dime in midair at 90 feet, shooting the thin edge of a playing card at 90 feet and then puncturing it with six or seven more shots before it hit the ground. Shooting the ashes off of a cigarette placed in Frank’s mouth always pleased the crowd. While touring in Europe, the Crown Prince of Germany demanded Annie shoot a cigarette from his mouth, but she would only do it if he held the cigarette in his hand. It wouldn’t do if the American “sure shot” blew the face off the Prince of Germany! In 1901, Annie suffered massive injuries in a train accident while traveling with the Wild West Show through North Carolina. After five spinal surgeries and temporary paralysis, she recovered. The injury did not affect her shooting skill and she continued to set records. In 1902 Annie left the Wild West Show to pursue a quieter life. She began an acting career and performed in a stage play written especially for her called The Western Girl. Annie also used her talents for philanthropy. She traveled the East coast, at her own expense, demonstrating the safe and effective use of firearms for World War I soldiers. Involved in women’s causes, Annie helped young girls, orphans, and widows to further their education. She believed it was crucial for women to “know how to handle firearms as “naturally as they know how to handle babies” and it is believed she taught over 15,000 women to use a gun. In 1904, William Randolph Hearst published a false story that Annie Oakley had been arrested for theft to support a cocaine habit. The story caught fire and newspapers all around the country printed the report. The woman who had actually been arrested was a burlesque performer who used the name “Annie Oakley.” Still, the newspapers, ever eager for a story of a fallen hero, persisted. Annie spent the next six years in court trying to regain her reputation. She won 54 out of 55 libel lawsuits against the newspapers. Hearst, in an attempt to avoid paying court judgments of $20,000, sent a private investigator to Darke County to get dirt on the famous sharpshooter. They found nothing. Well into her sixties, Annie continued her philanthropic work and also participated in shooting activities. In 1922 Annie entered a shooting contest at sixty-two years of age. She hit 100 clay targets in a row from 48 feet. Later that year, she and Frank were in a car accident where Annie sustained more injuries. Again, the injuries didn’t stop her and she continued to set records until 1924. In 1925 Annie’s health finally gave out. She died of pernicious anemia at the age of sixty-six. Annie Oakley, an American hero, is considered a role model for men and women alike because of her accomplishments and her moral character. She has been the subject of numerous articles and biographies, film and stage dramatizations, and her story is present in many historical museums. She was also inducted into the National Cowgirl Museum and Hall of Fame in Fort Worth, Texas. 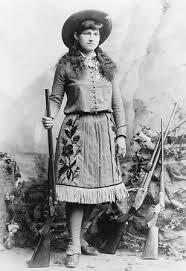 Phoebe Ann Mosey, (or Moses) most commonly known as Annie Oakley, learned self-reliance at a young age. The family lived in a cabin near Greenville, Ohio where the winters could be treacherous. When she was six years old, her father left the home in a snow storm. When he returned he was grievously ill and died a few months later of pneumonia, leaving the family in a dire financial situation. Her mother married again but the finances did not improve. Unable to feed all seven of her children, Susan Mosey sent Annie and her older sister, Sarah Ellen, to the “poor farm” also known as the Darke County Infirmary. They were put in the care of the Superintendent and his wife, and Annie and Sarah learned housekeeping skills in addition to embroidery and sewing. In the spring of 1870, Annie was “boarded out” to a family to help care for their son and help with household chores. The job would pay fifty cents a week and she was assured an education. The promises were not kept. Not much is known of this family and Annie never mentioned their names, but only referred to them as “the wolves.” They were exceptionally cruel to their young charge and would often beat her or lock her in a closet. Once, when she fell asleep doing some darning, they punished her by throwing her out into the snow with no shoes for the night. After two years of abuse from “the wolves,” Annie escaped and found her way back to her mother, who was again widowed and remarried. The family was still living in poverty. The only item that remained in the house belonging to Annie’s father was his shotgun. Longing for her father, Annie taught herself to shoot and started hunting game to help feed her family. She assuredly did not want to go back to the poor house! Word got out about Annie’s deadly aim and she soon started selling the game she killed to the locals in Greenville, as well as restaurants and hotels in Southern Ohio. Her birds were well sought after because Annie’s aim was so sure, she always hit the bird in the back of the head, thus leaving no shot pellets in the meat. By the time she was fifteen years old, Annie had made enough money to pay off the mortgage on the family farm. On Thanksgiving Day in 1875, the Baughman and Butler shooting act came to Cincinnati. Shooting was a popular past time and shooting contests were the perfect way for people to showcase their talents. Frank Butler, the traveling show’s marksman placed a bet for $100 (equivalent now to about $2,000) that he could beat any local shooter. Annie’s friends and family urged her to travel to the big city and try her luck. In the end, luck had nothing to do with it, but pure skill did. Imagine Butler’s surprise when fifteen year old, five-foot petite Annie turned up as one of the challengers. One by one, the targets were released (either live birds or glass balls). Annie shot and then Frank shot, neither one missing until the 25th target. Frank missed. The young, child-faced girl from Greenville won. While most men may have had their pride wounded or even been angry at the fact that a teenage girl had bested them at this coveted skill, Frank Butler’s reaction was quite different. He was smitten by Annie and after the contest he gave her tickets to his show. Soon, the two fell in love and were married. Annie joined the Baughman and Butler shooting act, not as a shooter, but as Frank’s assistant. One week, Baughman was sick and could not perform. Annie stepped in. Per her usual performance, Annie never missed a target and the crowd fell in love with the pretty petite sharp-shooter. She permanently replaced Baughman and the couple took their show on the road. In 1885, Annie auditioned for Buffalo Bill’s Wild West show. Impressed with her accuracy and lady-like demeanor, Bill Cody hired her, and Frank became her manager. Annie was soon the star attraction of the show and remained so for seventeen years. Whether she used a pistol, rifle or shotgun, “Little Sure Shot” as she was named by Chief Sitting Bull (also a star of the show) rarely missed. Her feats included shooting a dime in midair at 90 feet, shooting the thin edge of a playing card at 90 feet and then puncturing it with six or seven more shots before it hit the ground. Shooting the ashes off a cigarette placed in Frank’s mouth was a crowd favorite. While touring in Europe, the Crown Prince of Germany demanded that Annie shoot a cigarette from his mouth, but she would only do it if he held the cigarette in his hand. It wouldn’t do if the American “sure shot” blew the face off the Prince of Germany! In 1901 Annie was badly injured in a train accident. After five spinal surgeries and temporary paralysis she recovered. The injury did not affect her shooting skill and she continued to set records. In 1902 Annie left the Wild West Show to pursue a quieter life. She began an acting career and performed in a stage play written especially for her called The Western Girl. Annie also used her talents for philanthropy. 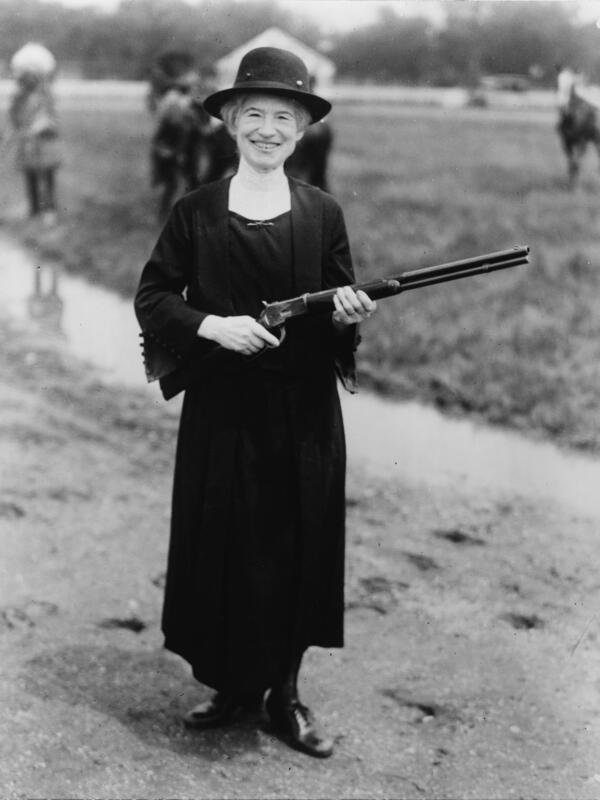 She traveled the East coast, at her own expense, demonstrating the safe and effective use of firearms for World War I soldiers. Annie was very involved in women’s causes and would help young girls, orphans and widows to further their education. She believed it was crucial for women to “know how to handle firearms as naturally as they know how to handle babies” and it is believed that she taught over 15,000 women to use a gun. In 1904, William Randolph Hearst published a false story that Annie Oakley had been arrested for theft to support a cocaine habit. The story caught fire and newspapers all around the country were printing the report. The woman who had actually been arrested was a burlesque performer who used the name “Annie Oakley.” Still, the newspapers, ever eager for a story of a fallen hero, persisted. Well into her sixties, Annie continued her philanthropic work and also participated in shooting activities. In 1922 Annie entered a shooting contest at sixty-two years of age. She hit 100 clay targets in a row from 48 feet. Later that year, she and Frank were in a car accident where Annie sustained more injuries. Again, the injuries didn’t stop her and she continued to set records till 1924. In 1925 Annie’s health finally gave out. She died of pernicious anemia at the age of sixty-six. Annie Oakley, an American hero, is considered a role model for men and women alike because of her accomplishments and her moral character. 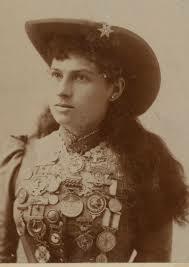 Annie Oakley has been the subject of numerous articles and biographies, film and stage dramatizations and her story is present in many historical museums. She was also inducted into the National Cowgirl Museum and Hall of Fame in Fort Worth, Texas. Subscribe below to my newsletter and receive this FREE E-BOOK! Receive "The 5 Secrets of Empowered Women in American History."